Equipment crafted by the royal blacksmith. Finely polished and ready for battle. 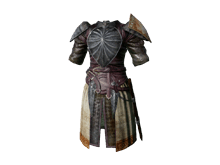 Sold by Maughlin the Armourer after spending 1,000 souls at his shop. Part of the Royal Soldier Set.